Crossings of more than 3 over 3 stitches become difficult on home knitting machines unless special techniques are brought into play. Methods and suggestions vary, depending on source. The least satisfactory one is to knit the whole row prior to the cable crossings at a looser tension. 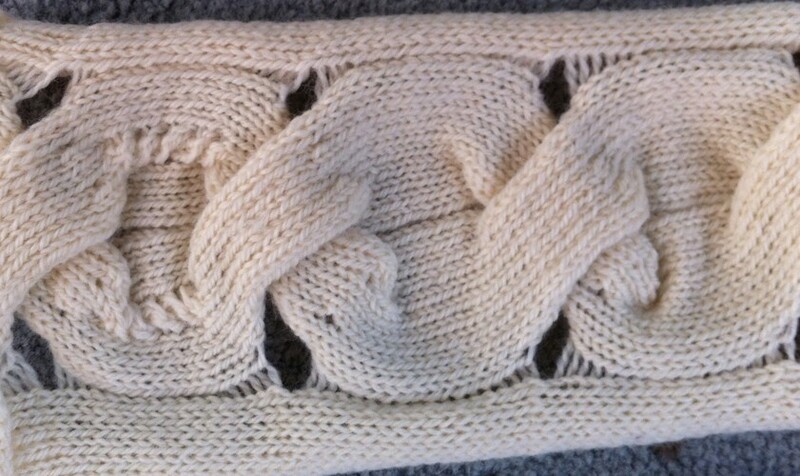 If there is plain knitting between crossings, the change in stitch size across that particular work may be quite noticeable. 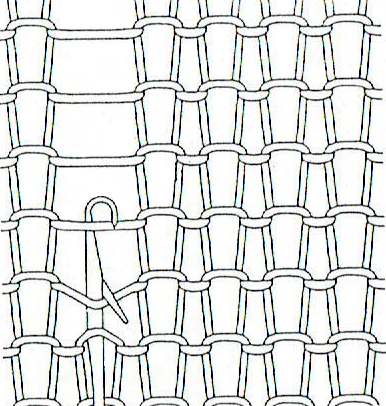 “All over” cabled fabric will be obviously narrower than plain knit, a feature that may be used in garment “shaping” to draw in resulting fabric in selective areas on plain knit grounds. Generally a looser tension will be required than when using the same yarn in plain knitting. To start testing the best number of rows knit between crosses, it is a good idea to begin with at least the same number of rows as the total number of stitches involved in the cross ie. 4 rows for a 2 X 2 cable, 6 for a 3 X 3. Working the knit on the single bed, extra yarn for a bit more “give” may be created by dropping one stitch on either side of the 2 groups to be crossed. 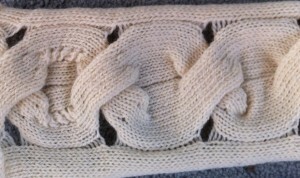 The dropped stitches may be latched up after each cross and will appear as purl stitches on the knit side, or left unraveled for open vertical space on cable sides. Bringing needles with crossed stitches all the way forward out to “holding” position helps them knit off more easily and to visually check if indeed all stitches have been placed on the alternate group of needles. Sometimes the cable configuration may be changed for a similar look to render crossings easier ie. 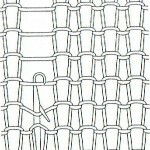 using a 5 stitch cable crossing 2 and 3 stitches respectively, may be substituted for a 6 stitch one. Larger number crosses may be broken down into smaller groups ie in this 9 stitch cable modification. 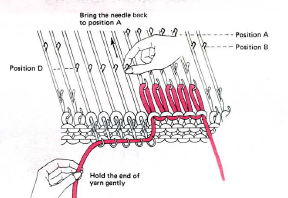 The chart below is for hand knitting, created in Intwined, with their accompanying directions. Not all publications or software approach HK and symbols and charts in the same manner, requiring varying degrees of study and interpretation in how to either follow or adapt them. 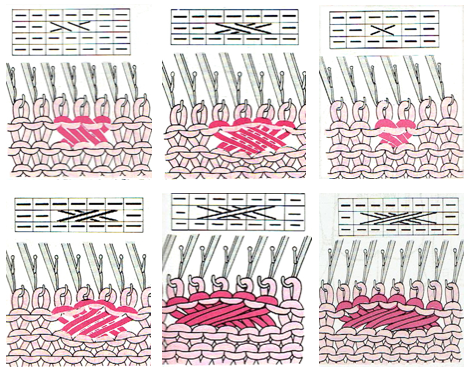 Larger groups of stitches may be cabled by using holding to shape each section, then removing each of them off the respective needle groups, and crossing them as wanted. As an experiment: for single, long crossing strip, I found 7 stitches to be pretty much my maximum manageable width, with tension adjustments. The number was chosen with the intent of using two 7 prong transfer tools to hold and move the stitch groups. The process: working over a group of 14 stitches for 7 X 7 cross. COR: Set your carriage for holding. I had a needle out of work on either side to make tracking easier. On the side opposite the carriage bring all beyond the 14 cable sts to hold, knit one row. Now pull all the needles out to work except for those involved in cable. Knit 3 rows across the 14 stitches. Bring 7 stitches opposite the carriage to hold. Knit an odd number of rows on them (7 in my sample). Yarn will be resting on top of some of the needles that have been in hold, watch that it remains free as you move stitches. Cross the long strip with the group of 7 stitches towards the front of the fabric, the rest toward its back / the purl side facing you. Bring cable group’s 14 stitches an the remaining on the side opposite the carriage into work, knit one row, there will still be stitches being held on carriage side. 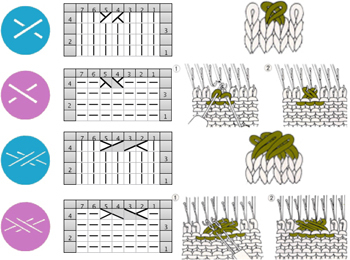 All stitches in work: knit desired even number of rows, ending with carriage on the same side as at the start of the process, and repeat process for crossings to continue in same the same direction. 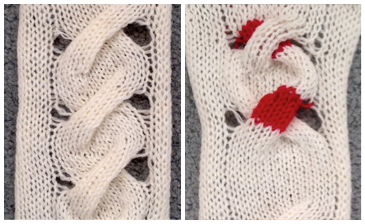 Each cable group may also be knit in individual strip forms and then crossed. At least one of the group pairs needs to be knit with a separate strand of yarn. Some experimentation on number of rows knit, etc., and attention paid not trapping the yarn in the wrong place when crosses are made is required. Both methods are fiddly, but manageable after repeats are sorted out. My sample is knit in acrylic, which flattens considerably with steaming . On the left are crosses made with single long strip, on the right, for illustration purposes, the red represents a second strand of yarn that I was able to keep continuous. To work cables with 2 separate strands of additional yarn, work each cross segment separately, then remove it on waste yarn, dropping it off the needles. Rehang each strip in desired location, crossing as required in pattern. Cut yarn ends may be woven in as plain knit rows between crosses are formed if piece is one color. The experimental swatch below is from one of my much earlier posts on topic. Though my examples here align in straight vertical manner, this method allows for placement anywhere on the knit, in desired spacing, repeat, and cross formation. Large safety pins, hand knitting stitch holders, and thin circular needles may be used as alternative tools to remove any strips of knitting and in turn used to ease those stitches onto their new needle placement. Using yarns that are not fragile or easily broken when tension is applied, and that have some amount of “give” at all, such wool as opposed to cotton, also render the process a bit more friendly. Yarns with “memory” such as wool will also retain dimensional qualities and spring back after any blocking. There are no single best ways to achieve any specific machine knit fabrics; personal preferences and adjustments evolve with experience. Please enter “cables” as a search topic on left to visit my previously published related posts. I may be changing web host and am experimenting with themes in my recently updated version of WordPress. This particular one renders content more easily viewable in portable devices, where sidebars are now available by toggling screens. Please excuse any inconvenience while issues are being sorted out, look for more frequent posts and changes in the new year. This topic has come up as part of previous posts. I recently reviewed links, and thought I would re-group them a bit differently here, adding some new. Please click on continue reading to have list appear as active links if they do not immediately do so in your browser. Latest additions are at post bottom. I have been trying to navigate Mac Numbers again, but in playing at my own latest charting with software after the Yosemite update, I find I am drifting back to using Excel once more as my primary “graph paper”. Charts published in foreign languages and magazines, and particularly those in Russian (where the same symbols appear to have different functions depending on the publisher) provide challenges in translating for using charts provided in hand or machine knitting. 4/24/15: sconcho is a GUI for creating knitting charts that comes with a built in stitch library. A manual is available. Custom stitch symbols may be created in Inkscape to form personal vector shapes. X11 may be required to run Inkscape on your computer as well, all are free.